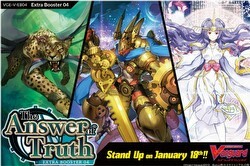 Every box of Cardfight Vanguard: The Answer of Truth boosters includes either 1 VR or 1 SVR. 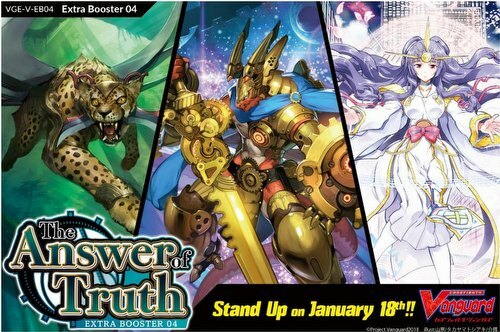 The Answer of Truth is recommended for experienced players due to the characteristics of the featured clans - Gear Chronicle (Force), Genesis (Force), and Great Nature (Accel). Decks for each clan can be constructed using cards from this set alone. The OR for Gear Chronicle will include a new illustration, as it is a new unit. Each box contains 12 packs. Each pack includes 7 random cards, including 2 cards that are rare or better! Each box will include a pack of Gift Markers (1 each for Force, Accel, and Protect, with one being a unit illustration version). There are 68 new cards in the set (3 VR, 6 RRR, 8 RR, 14 R, 37 C, plus 3 Parallel SVR and 3 Parallel OR cards.